We don't wait for writers to come to the periphery, we create our own kind of art. Brazil’s São Paulo is the largest city in Latin America, with a population of around 20 million people. Where Rio de Janeiro, a few hours up the coast, delights tourists with its beautiful scenery and relaxed beach lifestyle, São Paulo often horrifies visitors. 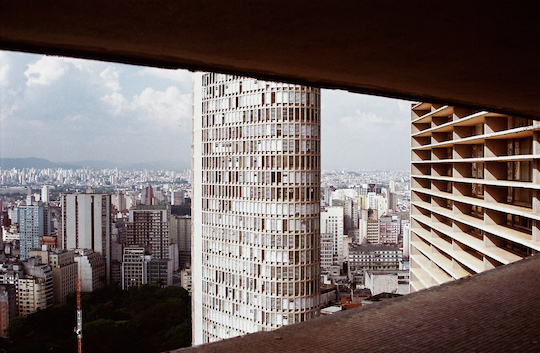 Dubbed ‘blade-runner in the tropics’ by the Serbian-born musician DJ Suba, who was one of Brazil’s most important producers, the city can seem, at first, like a dystopic mess of concrete towers and roads which continue endlessly into a shimmering grey horizon. What makes the city so vast is the miles and miles of densely packed poor neighbourhoods that border the city. Locals call this a peripheria—the periphery—or as margins—the margins. This border was built over the last few decades by immigrants to the city. Finding jobs but nowhere to live they began building their own homes on the outskirts of São Paulo. Poorly constructed houses and unplanned streets with very few amenities, the periphery has been described as medieval by some local commentators. Life here is often characterised by violence, crime and isolation. Locals with low-paid service jobs in the centre of the city often commute four or five hours a day to get to work because of problems with roads, transport, and traffic. All of this makes the fact that the São Paulo periphery is home to one of the most popular Brazilian literary movements in recent years all the more surprising. Poetry salons, called Saraus, happen all around the periphery every day of the week, where writers and poets recite compositions detailing life in their neighbourhoods. The best of these events are packed with people of all ages and from all backgrounds. There are very few established writers who have not made the pilgrimage to a periphery Sarau. The movement even has its very own bookshop, devoted to all that is marginal, located in the centre of the city. The author Ferrez is known as the father of the Literatura Marginal movement. His novel, Capão Pecado, published in 2000, was one of the first contemporary accounts of life in the periphery by an author who grew up there. Its descriptions of violence, use of city and hip-hop influenced slang, and characters who often seem to have no future made the book a classic and Ferrez himself a household name. When he coined the phrase Literatura Marginal, he became a symbolic role model for a generation of marginal writers.